According to multiple sources, including information from the Centre of Volcanology and Geological Hazard Mitigation (PVMBG) trough its communication centre: Magma , new eruptive activity was confirmed in June 2018. On the 12th July 2018 at around 19:00 in the evening, I noticed that a eruption from Krakatau was visible at the online PVMBG Krakatau CCTV. 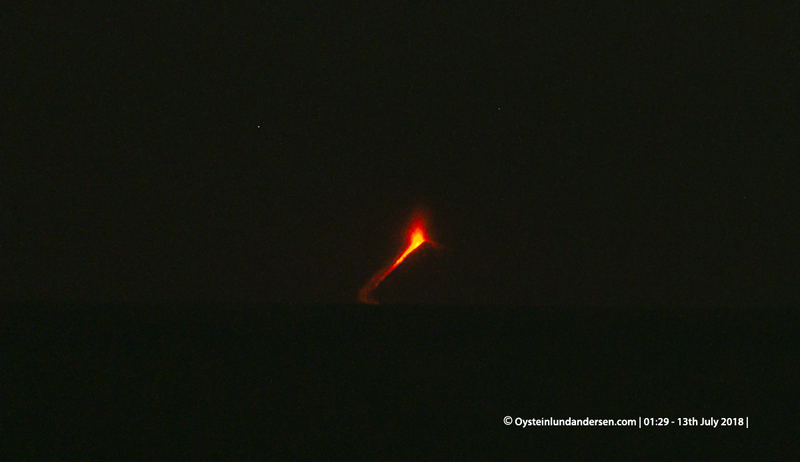 A glow was present in the middle of the Sunda Strait, and after seeing multiple frames, I was convinced that it was actually Krakatau. I made the decision to drive to the coast of Java to see for myself. 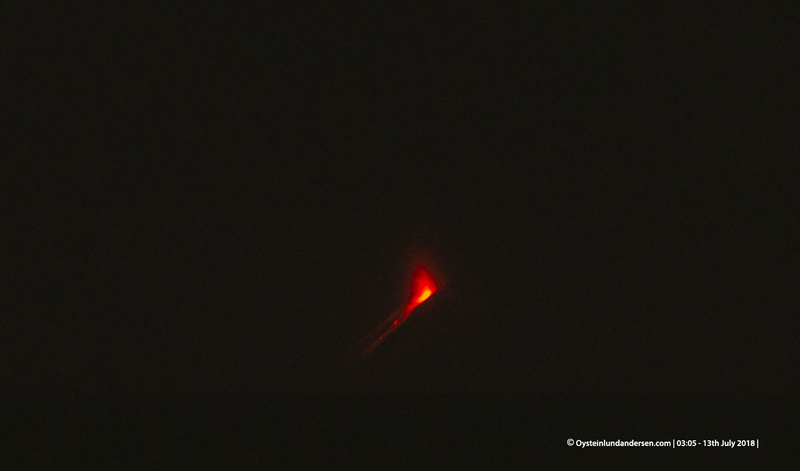 Out at sea Krakatau was glowing red on the horizon. 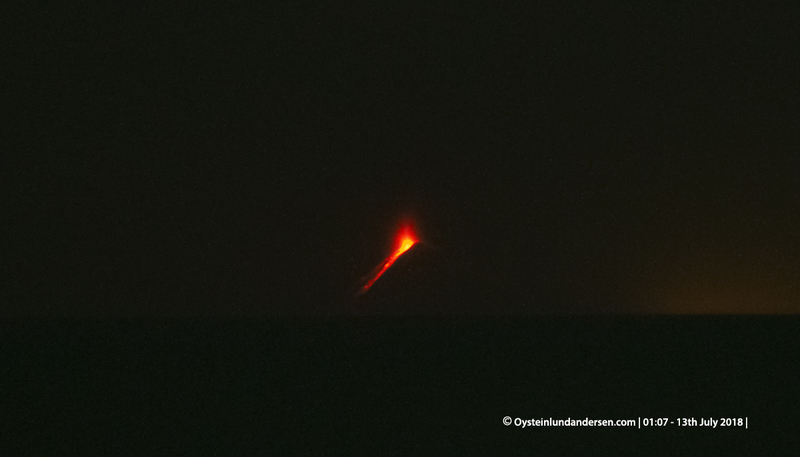 Using my zoom-lens I was able to see and photograph the ongoing eruptive Activity, even tough I was situated 47km from Krakatau. From what I could see, Anak-Krakatau was in a state of continous eruption. Please see photo 3-10 below. 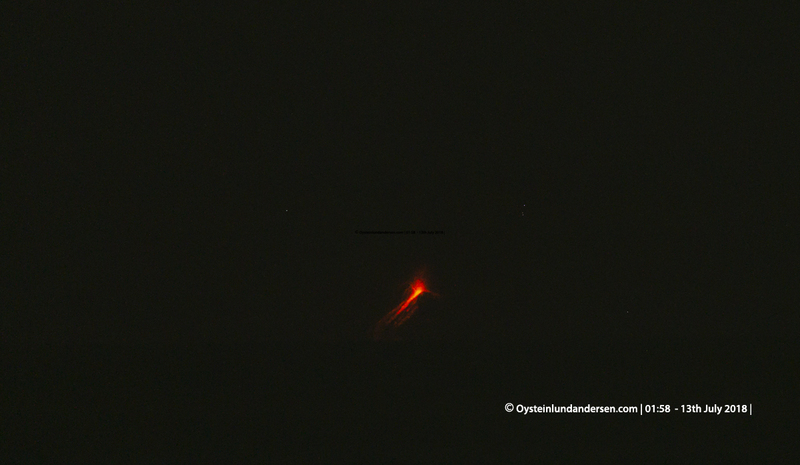 Also I have added a timelapse video of the individual photo frames of Krakatau, see video below. 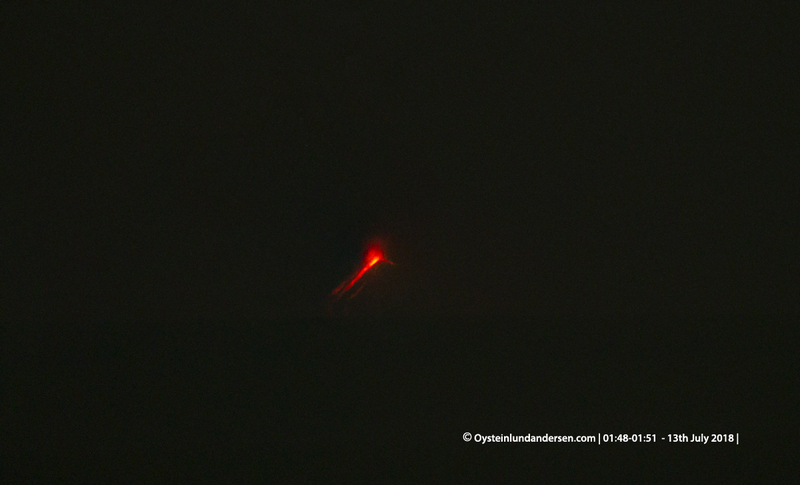 Incandescent material was being erupted continously, and lava seem to almost reach the sea on the Southern side. Might indictate a new lava-flow to the South?. Sentinel 2 satelite image of Anak-Krakatau of 12th July seem to support this idea, as you can see something that looks like a black-lava flow to the South. The flow however does not seem to have reached the sea (as of 12th July image). 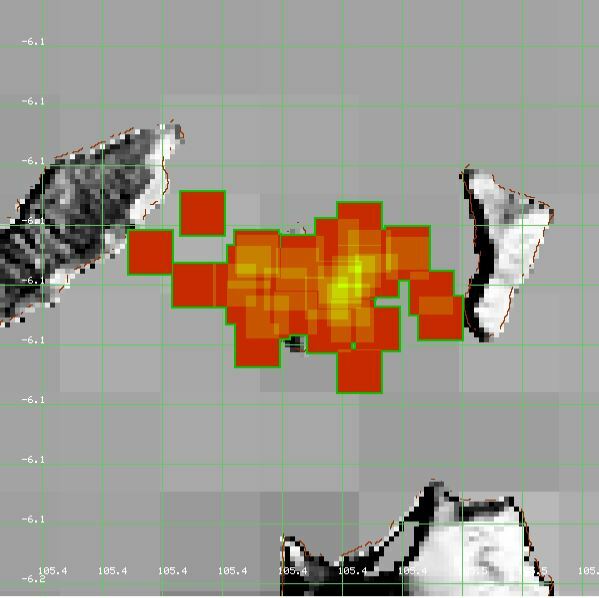 See also MODIS image of hotspots detected between 11-16th July, that confirms Activity at Anak-krakatau. I visited the PVMBG Krakatau observatory in Anyer. 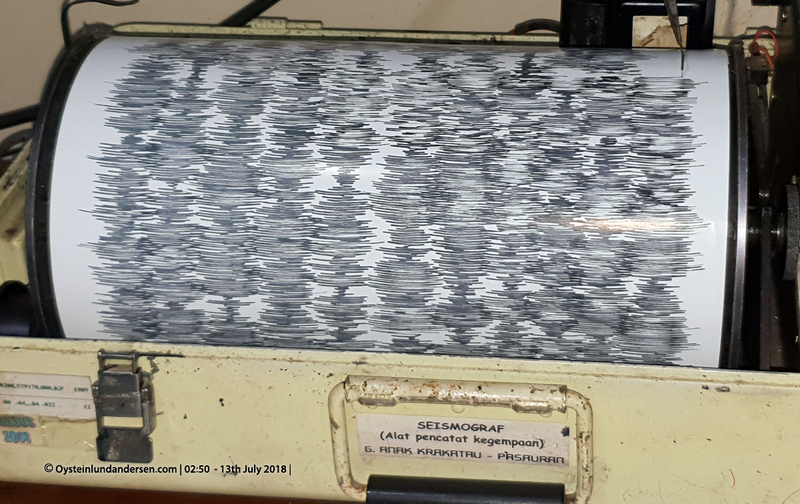 The staff (1+1 shift) were busy reading and taking notes from the seismogram (see photo no.1 and 2 below), and could tell that Anak-krakatau had been in this state of continous eruption since 2 days ago (11th July?). The rumbling sound from the eruption could even be heard within the observatory, and windows/walls were shaking, and made a shaking sound – when the largest sound-waves hit the observatory. I observed, photographed and recorded sound from the eruption during a period of approx. 3 hours in period 23:45 local time on the 12th July to 03:30 local time on the 13th July. 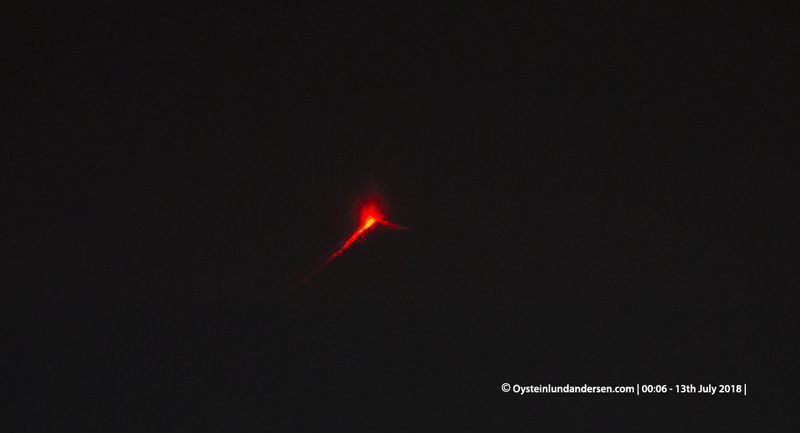 The eruption was continous during the whole 3 hours of observation. 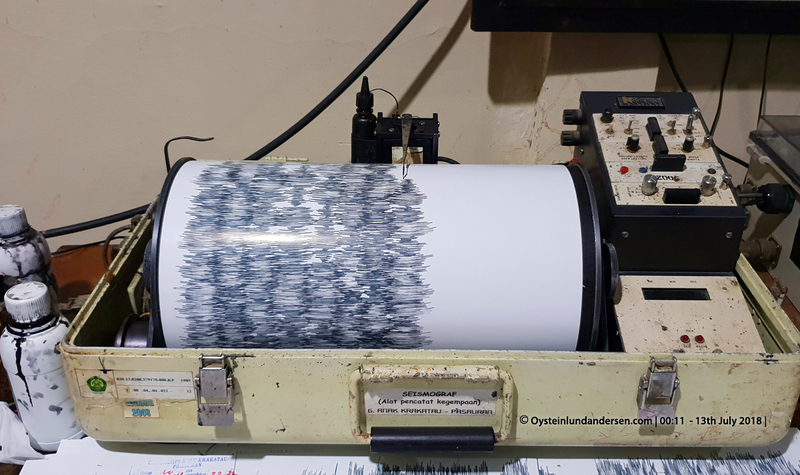 The experience being able to listen/feel the eruption of Krakatau from the mainland of Java, almost 50km away as indeed a rare one and great experience. Having experienced several eruptions at Anak-Krakatau before, including being at Rakata Isl. (4km from) during the eruption that emplaced a lava flow in September 2012, naturally the sound experience was totally different. Because of the difference in distance from the volcano. Being at Krakatau during 2012 was just like listening to a explosive jet engine, but as described above – listing to the eruption from far was like the sound of distant canonfire. Total photos in this article: 10. Video/Sound file: 1.